The holidays are almost here and that means we need to take safety precautions around the house to make sure everyone stays safe this holiday season. The holidays are wonderful time of year, we get together with friends and family, share a meal, good conversation and there might even be some presents. That should be safe, right? Not always, the holidays can be a dangerous time for pets, children and adults if we don’t go to extra efforts to make sure everything is in order. 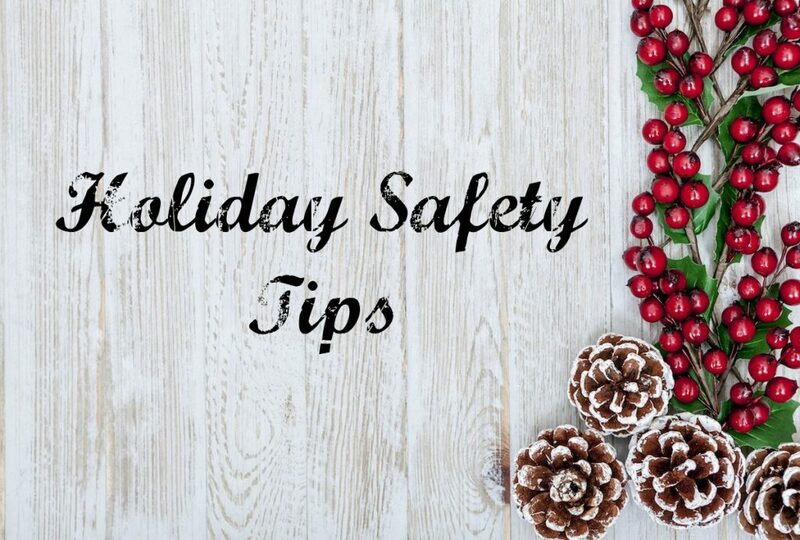 Here are some holiday safety tips to help you have a wonderful holiday season. Lights – This time of year we use all kinds of lights to make our homes look merry and bright. We trim the tree with lights and decorate our homes with festive lights. Ensure they are good working order before hanging lights. If you’ve stored your holiday lights in an attic or crawl space, check to make sure critters haven’t chewed through any cording. If they have, throw them away and replace with new. Ladder Safety – We’ll spend more time on a ladder this time of year than any other time. Follow any precautions that are on the ladder you are using, all are different so be sure to follow the warning on your ladder. Place ladder on a steady surface and don’t try to use it on a makeshift surface like on top of a chair or table. If climbing to the highest rung be sure to have someone to hold the ladder steady for you. Wear shoes that are tied while using the ladder. Fireplace – If it’s been a while since you had your chimney professionally serviced, now would be a good time to do so. Soot and grime can accumulate on the inside of the chimney and catch fire. Plants – The holidays are a time when many people give plants to one another, some of these plants can be toxic to animals and small humans. If you receive a plant but aren’t sure of it’s safety you can check it out on the ProFlowers website. Keep the Poison Control Center number on hand – 1-800-222-1222. Candles – Candles make the holiday, but they can be dangerous if left unattended. Consider using flameless candles or if using the real thing, make sure a responsible adult is always in the room with the candle. Turkey Fryer – Nothing tastes better than a deep fried turkey (and they cook really fast! ), but a turkey fryer can be dangerous if not tended to properly. Burns and fire can happen in the blink of an eye if not careful. Use fryer outside and make sure there is always someone tending to it. Read and follow all instructions. Food Safety – Practice safe food handling and storage techniques. Wash hands frequently when handling food and cook to the appropriate temperature – use a food thermometer to be sure. Store food for up to four days in the fridge. The holidays are a wonderful time, and even better when everyone is safe. Have a Happy Thanksgiving from all of us at EBS Security!